The Lebanon Soup Kitchen is established for the purpose of providing nutritous meals at no cost to those who desire or need them regardless of race, creed, gender or financial need. Monday, Wednesday and Friday from 4:30 P.M. to 5:30 P.M.
Financial donations are welcomed to help with the rising cost of preparing a meal. 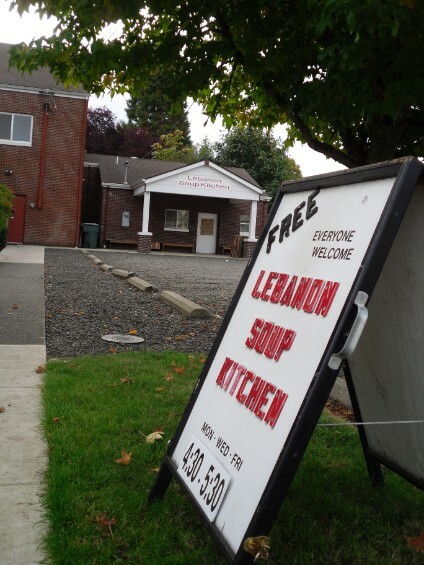 Checks may be made to Lebanon Soup Kitchen and mailed to 170 E. Grant St., Lebanon, OR 97355. You can donate: Juice (frozen, canned, or powder), Cheese (greated or chunk), Vegtables, Eggs, and many other items. Some items that are not normaly thought of are toilet paper, paper towels, and napkins. For information on in-kind donations call the Soup Kitchen at 541-451-7667. 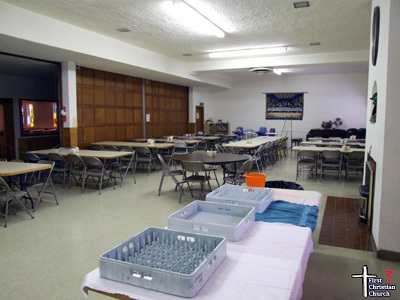 The Soup Kitchen needs volunteers to help cook, serve, wash dishes, clean tables and floors, do laundry or pickup donations. If you are interested in joining the board or more information on volunteering, Click Here to email Genna, or call the Soup Kitchen at 541-451-7667. Miracles Among Us reveals the miracles God works in the lives of the servers and the served. People come searching for acceptance of who they are and validation of their value as a human. See and feel the lives of the needy, the desperate and the lonely and learn how similar we all are. 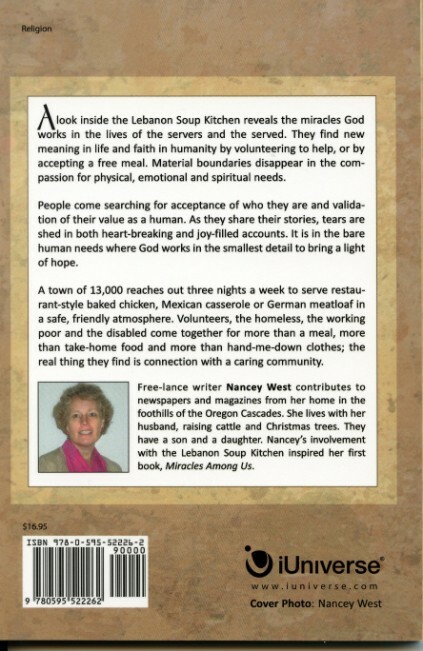 Author Nancey West was among the ones to organize and open the Soup Kitchen and is currently serving as board chair. She and her husband, Jon, raise cattle and Christmas trees outside of Lebanon. 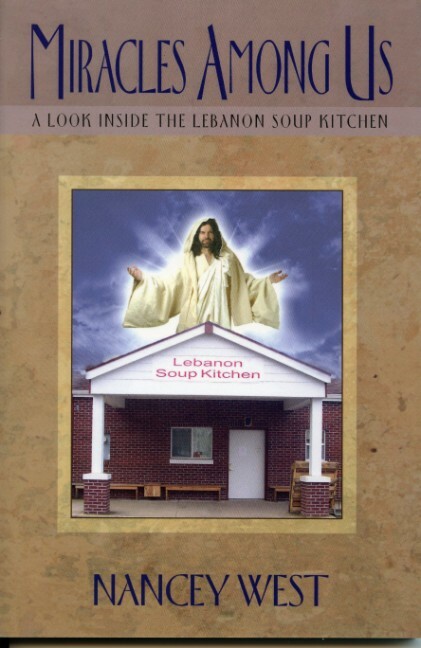 You may purchase the book online at www.nanceyswest.com or for an autographed copy send $20 to 170 E. Grant St., Lebanon, OR 97355 and make the check out to Lebanon Soup Kitchen. In 1989, Marcy Huntsinger saw a need and began a personal quest to establish a way to feed the hungry in Lebanon. She talked with the Lebanon First Christian Church to use their facilities and soon had a committed community working to feed anyone who needed food or fellowship. Support with donations or volunteers have come from Our Savior's Lutheran Church, St. Martin's Episcopal Church, United Methodist Church, First Christian Church, Southside Church of Christ, Presbyterian Church, Valleyview and First Baptist Church. Roth's, Shop-N-Kart and Big Town Hero have donated bread and desserts since the opening in 1989. Many organizations and individuals have been faithful in their support. All are greatly appreciated.